Serve savory soups and broths in style with this Le Creuset soup bowl set. Sleek and stylish, each of the four French-onion soup bowls bring both beauty and versatility to any kitchen collection. Made from durable stoneware, each bowl has a long handle for easy transport. The high-quality exterior enamel protects against metal marks and other damage, while the stoneware design has less than one percent porosity to block moisture absorption, which can lead to cracking, crazing, and rippling along the interior. 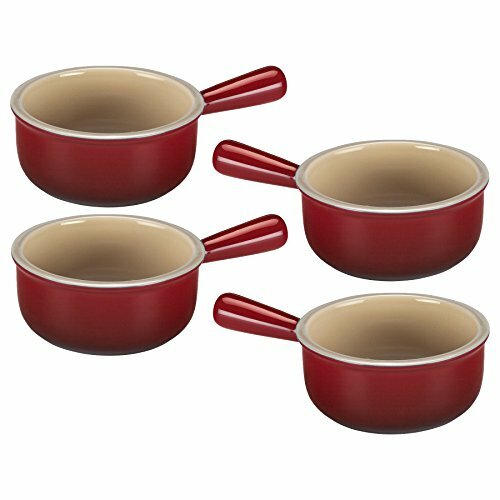 Resistant to staining and flavor and odor absorption, this bowl set features a virtually nonstick glazed interior that easily releases foods for quick cleanup. With unmatched thermal resistance from -65 degrees Fahrenheit to 500 degrees Fahrenheit, these bowls are safe for the freezer, microwave, oven, broiler, and dishwasher.